Oceanfront Beauty. 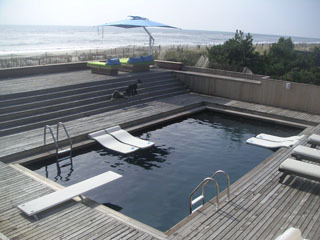 Come enjoy the beach in this spectacular property. Live directly on the Atlantic Ocean. This recently renovated three bedroom houses is available. Stunning living room with walls of glass onto the beach. Open gourmet kitchen. Huge master suite with commanding ocean views. Hot tub. Beautifully furnished owner occupied house available for a July monthly rental. Large and sunny living room with open gourmet kitchen. Lovely sunken den area with fireplace. Four bedrooms. Wonderful outdoor space. Sunny pool area. Fantastic multi level roof deck with panoramic views and hot tub. Central AC. WIFI. 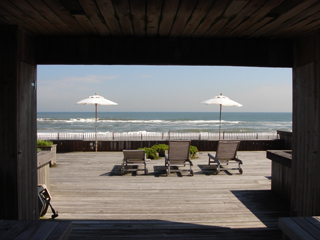 4 Bedrooms, 2 1/2 baths ON THE OCEAN, amazing views from upstairs bedrooms. 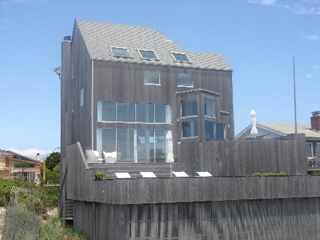 A classic Fire Island Pines house, very comfortable home! Ocean front amazement! 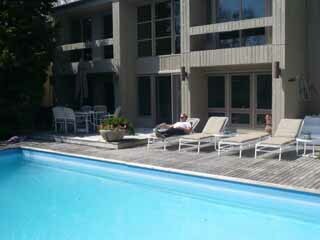 Large, spacious, central A/C, pool, hot tub, total indulgence. Live on the ocean for your weeks get away in The Pines. One of the most sought after homes. Rarely available pristine ocean front beauty. Wonderful house. Designer finishes. Open living room with commanding ocean views. Fireplace. Chefs kitchen. Open dining room. Great master suite. Two guest rooms. Pool and hot tub. Beautiful bay front home. Elegance on the bay! Near town, 4 BR , 3 bath, pool, large state of the art kitchen, living room opens up onto magnificent decks and pool area overlooking the GREAT SOUTH BAY. Lovely studio apartment in the coops. Steps to town and steps to the beach. Convenient to everything. Its the perfect spot for a get away. Ideal for a single person or could be a little love bungalow for a couple. 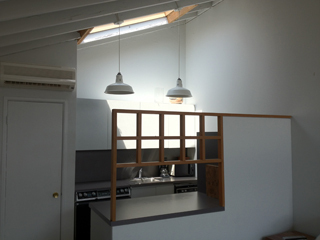 Ample living quarters with wonderful kitchen and a sunny terrace. Available for May, June or both. A large swimmming pool facing the sun all day long, great landscape with gardens and koi pond, marble bathrooms, large open kitchen. 2nd floor master suite is separated from 1st floor guest rooms. 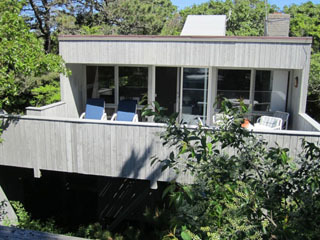 Private deck off the 2nd floor. 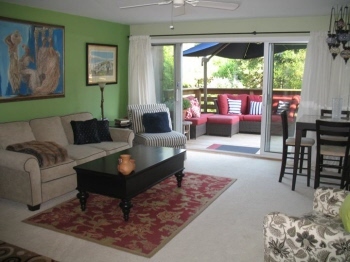 Beautifully furnished and appointed and Air conditioned! 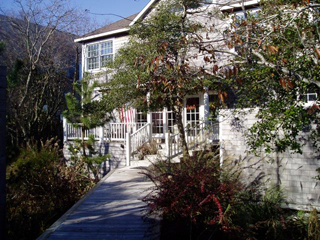 Pines Harbor Realty is proud to present this lovely house for your vacation in the Pines. Timeless architecture. Simple clean lines. Walls of glass. 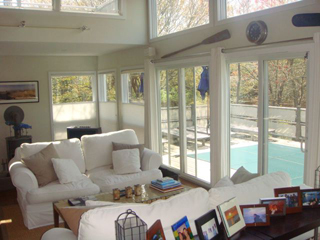 The second floor great room with fireplace opens directly onto a large sunny terrace. Master suite with private bath. Two guestrooms share an additional bathroom. Fantastic location?close to town and close to the beach. Air-conditioned for your comfort. One of the most luxurious properties in The Pines. Close to the harbor. 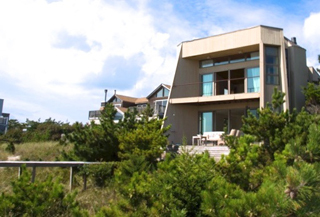 This oceanfront gem has five bedrooms with four and one half baths. Gorgeous master suite overlooking the ocean. Has custom designed furniture throughout with central air, retractable outdoor awnings, extra large heated pool, hot tub, gourmet chef's kitchen, 2 sub zero refrigerators, two dish washers and all the bells and whistles with every amenity in a luxurious oceanfront beach house. A perfect situation. A lovely one bedroom one bath co-op for the month of August. Air conditioned, newly renovated and with lots of sun. An extra large deck with ample sun. Seconds to to harbor and beach. Close to town 3 bedroom 2 bath with a/c. Great deck with large pool and hot tub. Cant get a better location. Available for 5 weeks.